Macro-regional Strategies represent a new opportunity for comprehensive development of a larger territory, addressing common challenges and potential, and are perceived as a qualitative leap fostering synergies for better territorial governance. The EU Strategy for the Adriatic and Ionian Region (EUSAIR). Consequently, they have to be taken into consideration as they cover several policies, which are targeted at a “macro-region” level. Out of the five (5) participating countries of the BalkanMed Programme only one, Bulgaria, participates in the EU Strategy for the Danube Region (EUSDR). Yet, the priorities of programme took into consideration contribution to implementing the EUSDR, within the areas delineated by the EUSDR Action Plan to make the region environmentally sustainable, prosperous, accessible and attractive, as well as safe and secure. 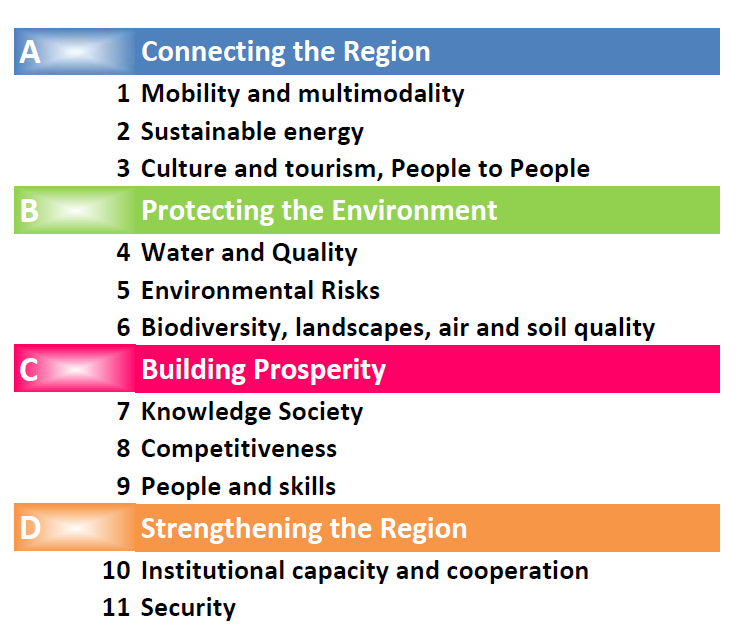 The Danube Region Strategy addresses a wide range of issues, distributed among four (4) pillars and eleven (11) priority areas. Danube River is a key territorial feature as it represents the Northern country border of Bulgaria thus in the EU official documents for Bulgarian national authorities: “Position of the Commission Services on the development of Partnership Agreement and programmes for the period 2014-2020”, the Commission has underlined that the EUSDR objectives must be incorporated when defining priority areas for cooperation. The EUSDR focuses on the development of stronger synergic connections between the authorities on all levels aiming the optimization of the impact of both, activities and financing. BalkanMed has taken into account the European Commission comments and the chosen thematic objectives are in line with the recommendations of the European Commission Position papers. The Programme could support the implementation of the EUSDR by contributing to three (3) of its pillars and to seven (7) of its eleven (11) Priority Areas. The transnational cooperation dimension is extremely relevant, for the integrated and interdependent environmental systems both for the region as a whole, but also with reference to the Danube Basin as formulated in the EUSDR. Due to the financial capacity of the programme, the coordination of projects implemented in the cooperation area with those implemented in the Danube Region is particularly relevant. The programme also envisages actions designed to achieve 2020 EU target for biodiversity, through Natura 2000 sites’ management, as well as other designated or protected areas’ management and raise awareness about soil protection, educate children and young people and build capacities of the local authorities in the environment-related monitoring standards. In the process of programme implementation, effective cooperation of the respective implementing bodies will be sought to ensure synergies and complementarities. EUSAIR is relevant to BalkanMed as complementarities emerge mainly on environment conservation and management. In this respect it shall be taken into consideration that only two (2) countries, Albania and Greece, are covered by the EUSAIR. 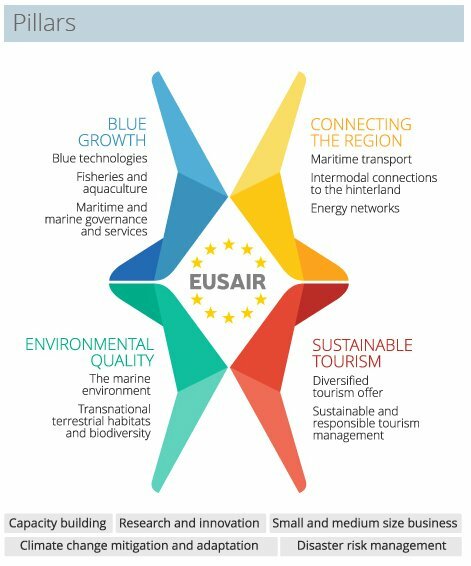 The EUSAIR Strategy aims at promoting sustainable economic and social prosperity of the Adriatic and Ionian region through growth and jobs creation, by improving its attractiveness, competitiveness and connectivity while at the same time preserving the environment and ensuring healthy and balanced marine and coastal ecosystems. The strategy is focused on four (4) Pillars: “Driving innovative maritime and marine growth”, “Connecting the Region”, “Preserving, protecting and improving the quality of the environment” and “Increasing regional attractiveness”. "Research, innovation and SMEs development", as well as "Capacity Building" are two cross-cutting aspects across those pillars. The shared element of the Adriatic-Ionian participating regions is the common sea basin. Consequently, actions will be developed with needs and potentials of sea-related activities proving more emphasis on blue growth. Furthermore integrated marine and coastal management within the Balkan Mediterranean area can boost “blue growth” opportunities anchoring a strong maritime pillar to the programme strategy. At the same time integrated approach for sustainable growth can mitigate the land – sea environmental pressures suffered throughout the coastlines. Regarding “research, innovation and SMEs development”, actions under the first topic “blue technology” and the second topic “fisheries and aquaculture” both have focus on research and innovation. At programme level, while the “Balkan-Mediterranean 2014-2020” transnational cooperation programme establish links between competitiveness and training, the programme of Adriatic – Ionian makes a thorough exploration of the priority providing potentials for complementarity and synergies. Both programmes would provide as well value added to the selected TO 6 tackling environment and resources efficiency. Through TO3, targeting the competitiveness of the SMEs, the Adriatic-Ionian aims at sustainable economic growth and business opportunities out of the blue economy sector (aquaculture, fisheries, blue biotechnologies, marine and maritime services, etc.). While BalkanMed focus is free of any particular sector. Instead, competitiveness is tackled also by supporting SMEs capacities under training schemes. Regarding sustainable growth, EUSAIR gives clear emphasis to the Maritime Spatial Planning, while inclusive growth is also promoted through blue growth and jobs opportunities of marine and maritime sectors. The environment priority (PA 2) of the Balkan-Mediterranean connect with the environmental pillar 2 of EUSAIR on preserving biodiversity, ecosystems, and services by implementing the European ecological network Natura 2000 and enhancing governance support and coordination efforts for environmental protection. The scope of EUSAIR is much broader, both in geography and thematic targeted. Consequently, synergies with the Balkan-Mediterranean programme can be easily established in relation to cultural and natural heritage conservation and promotion. The Adriatic – Ionian Operational Programme targets five (5) TOs, and seven (7) IPs out of which TO 3 and TO 6 match with the “Balkan-Mediterranean 2014-2020” transnational cooperation programme. To optimise and maximise territorial impact, both ETC programmes shall consider complementarities and synergies, both at programme and project levels. Two of the BalkanMed participating countries, Bulgaria and Greece, are part of the Black Sea area. On 20 January 2011 the European Parliament (EP) adopted a resolution calling for an 'EU Strategy for the Black Sea' to enhance the coherence and visibility of EU action in the region. The resolution provided the European Commission and the Union's High Representative for Foreign Affairs and Security Policy with guidance on drafting the strategy. Security, energy and socio-economic development were emphasised, and a separate EU budget line for implementation (which should benefit from 'efficient disbursement methods') was requested. In fact, the idea of a future EU Black Sea strategy had already been included in the European Parliament's resolution of 17 January 2008 on a “Black Sea Regional Policy Approach” which welcomed the Commission's decision to initiate an EU Black Sea policy framework, laid out in the Commission's communication of 11 April 2007 on Black Sea Synergy. Security and good governance covers 13 topics, all of which are out of the scope of the Balkan-Mediterranean programme. Energy, transport and the environment consists of 17 conclusions and recommendations for actions most of which are linked to the energy sector and energy efficiency considering the Black Sea region to be of strategic importance for EU energy security and the diversification of the EU's energy supply. The strategy considers cooperation in the areas of energy, transport and the environment to be crucial to the harmonious and sustainable development of the region. Relevant to the Balkan-Mediterranean programme (PA2) is the EU understanding about the importance of the Black Sea as a natural resource and the identified need for a balance to be struck between economic development and environmental protection. EU also stresses the need for full implementation of the “Convention on the protection of the Black Sea against pollution”. Economic, social and human development priority presents 12 statements which focus on the understanding that the economic, social and human development of the region as a whole should be promoted. Coherent to the PA 1 of the Balkan-Mediterranean programme are those aimed at encouraging cooperation on education, research and technology, promoting social development, exchange of best practices between regions, improvement of the administrative capacity of all local and regional stakeholders. In order to ensure regional complementarity coordination shall be considered at both programme and projects level.